GEMS and JEWELS in GOSFORTH! This post was written by peterjmurray on October 24th, 2018 3:38 pm Comments Off on GEMS and JEWELS in GOSFORTH! Days 3 and 4 of our NE visit were spent in Gosforth Central and Gosforth East middle schools respectively. 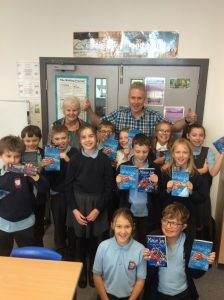 These are two of our favourite schools and with good reason – there are so many pupils and they are all fans of our books! Gosforth Central gave us around 250 Year 5’s and 6’s to make up our KS2 audience. Gosforth East (GEMS) gave us around the same. Both audiences were an absolute delight to work with. We got through all of our six Mokee Joe books with ease, climaxing on the final narrative set in Dubai. It turned out that many of our audience had already visited Dubai and were well-familiar with the tallest building in the world (Burj Khalif), the world’s biggest aquarium and the amazing dancing fountains, to name but just a few of the action-packed settings used in the narrative. Brilliant! A BIG thank you to the staff of both schools and to Sarah, the librarian at Gosforth Central, for looking after us so well. And, of course, to all of the pupils who are now ‘devouring’ the books in the Mokee Joe series. I know that at present you are still at school whilst we are on half-term down here in the south, but have a lovely half-term next week…and then you can smile and think of us being back at work! *Apologies to anyone who has contacted my website recently and not received a reply. It turns out that there is a malfunction on the site and this is being rectified as I type this message (Wed 24th October). So please get in touch again if you wish and I’ll get right back to you. 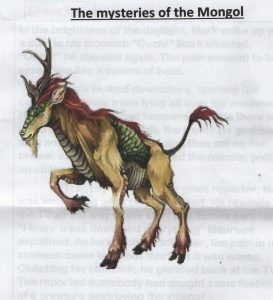 This post was written by peterjmurray on October 16th, 2018 5:33 pm Comments Off on NORTH EASTERLY MAGIC! Our week up in the North East has got off with a ‘BANG’ to say the least! There’s no shortage of avid readers up in this area and it’s pleasing to report that most of them are reading (or have read) our books! First stop on Monday morning was Ponteland. 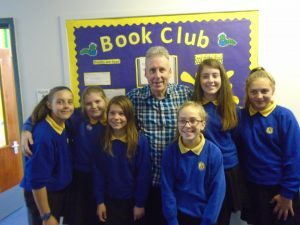 Our host, Mr Harvey (Belsay School), had organised a get-together of Year 6’s from six primary schools local to the area to assemble at Richard Coates Primary to see my presentation. The schools were all fabulous to work with and I feel I must mention them by name – Ponteland, Whalton C of E, Belsay, Heddon, Stamfordham and ,of course, Richard Coates. The presentation was fast and furious, but at least it seemed to engage the 300+ audience as I covered the entire series of Mokee Joe books produced over the last 14 years. A HUGE ‘thank you’ to Mr Harvey and all of the staff from each of the schools for taking the trouble to bring our audience to us…we hope you got as much out of it as we did. We really hope to visit you again in the not-too-distant future. number of times throughout my author career…and not without reason. The teachers have always pulled together to create a fantastic reading culture in this BIG school community. Once again Kath and I were received like ‘old friends’ and shown the utmost friendliness by the youngest Year 5 to the eldest of the Year 8s. We love working at this school! Mr Bell and his team of keen librarians set about arranging the hall in readiness to accommodate all 400+ pupils. They did a sterling job and I began my presentation in front of a brilliant audience where everyone could see and hear exactly what was going on and join in at every opportunity. One and half hours passed VERY quickly to say the least! The staff and pupils were so appreciative I felt I could have gone on forever! Tomorrow, we return to officially open the school library and sign books for our willing fans…it could be a very interesting experience and I just wonder if the record for the number of Mokee Joe books signed in one afternoon might well be broken?? Well…I think the record WAS just about broken! I think my signing hand was broken too by the end of it! 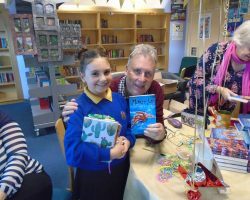 The signing went on forever and everyone was just ‘buzzing’ about books and artwork and all things to with literacy. Brilliant! We even signed a book for Phoebe who had overnight adjusted her hair to Molly’s new hairstyle (Molly is the girl hero in the Mokee Joe books) and it seems that ‘space-buns’ are fast becoming really trendy. A ‘HUGE’ thank you to Mr Bell for all his hard work, and to the staff and pupils for ensuring our visit was such a memorable one. We will be back…and the sooner the better! Wow! What an amazing couple of days in Luton! OK…so Luton may not be the most attractive location in the UK, but the schools are nothing short of brilliant to work in. Challney High School for Girls proved no exception. 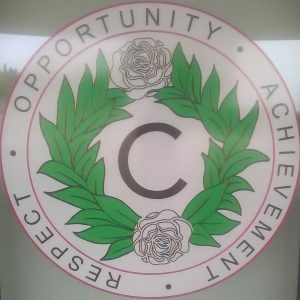 We were immediately impressed by the school and its campus – very attractive – and drawn to the logo decorating the wall outside the school reception (see pic). After working in this school all day Thursday and spending much of Friday signing books, Kath and I decided the ‘C’ in the logo should be replaced with an ‘R’. Never have we been treated with such ‘RESPECT’ as shown by the Challney Girls. We worked with just over 200 Year 7’s, but the elder pupils were just as keen to meet and chat with us, remembering us from our visits to their primary schools in the not-too-distant past. A very big presentation on Thursday morning followed by two workshops may well have proved exhausting, but incredibly worthwhile as our keen followers hung on every word and joined in at every opportunity. I just wanted to say thank you for inspiring me. The first time I read your book (Bonebreaker) I wanted to be an author. 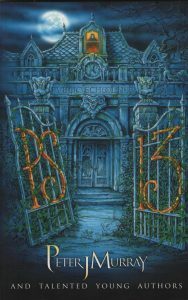 I attempted to write a book where all your evil characters and the good characters in your book go into a haunted maze. Other people go into the maze and think it’s just a Halloween stunt…but it’s not…and the good characters have to save everyone! Anyway, thanks for inspiring me again. Best wishes from your biggest fan! I suspect my ‘biggest fan’ is a bit on the shy side as she didn’t sign off to say who she was. But if you’re reading this, then an even bigger ‘THANK YOU’ from me. It’s little messages like this that keep authors like me inspired to carry on writing! …So thank you, Ms Anonymous, thank you Challney girls and thank you Challney staff…you did us proud. We will be back!